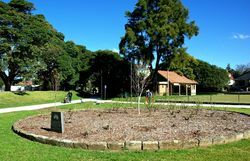 The Memorial commemorates the men of Sparrow Force and the people of East Timor who died in Timor during World War Two. As early as February 1941 Australia had agreed with Dutch and British officials that Allied troops, under Australia's command, would reinforce Timor should Japan enter the war. 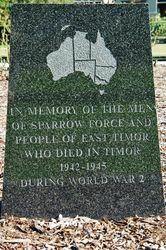 Sparrow Force", as the Allied presence on Timor was known, landed on the Timor five days after the Japanese attack on Pearl Harbor. This was part of a strategy of seeking to defend forward airfields and also involved deploying "Lark Force" at Rabaul and "Gull Force" at Ambon. Although agreeing to garrison Timor with troops, Allied commanders did not envisage a large-scale Japanese attack on the island. Nor did they have the agreement of the Portuguese to occupy the eastern part of the island; the colonial administration took the "extravagantly optimistic view" that Japanese forces would respect Portuguese neutrality. (Koepang) Kupang, the centre of Dutch rule, was the focus of the Japanese attack. Facing them were troops from the Australian 2/40th Battalion, a squadron of Royal Australian Air Force (RAAF) Hudson bombers, a battery of Australian coast artillery, and 1,000 Dutch troops. Surrounded and short of ammunition, they held out for four days but were forced to surrender on 23 February 1942. A further 250 men of the Australian 2/2nd Independent Company had been sent to the Portuguese part of the island before the Japanese attack. They did not directly oppose the invasion but acted as a guerrilla force. After the surrender of the main Allied force around Koepang, 140 members of the 2/40th and some Dutch troops were able to avoid the encirclement; some were handed to the Japanese by West Timorese, while the remainder made their way across the island to join the 2/2nd. Timor's rugged terrain offered ideal conditions for guerrilla warfare, but the early success of these operations was made possible by the support of the Timorese people, who provided food and shelter, ponies for carrying heavy equipment, acted as porters and guides, and helped set up ambushes. Some took up arms themselves and fought alongside the Australians. Many Timorese were executed by the Japanese for providing assistance to the guerrillas. Assistance also came from the Portuguese who, as representatives of a neutral country, had been allowed to maintain order in their colony.